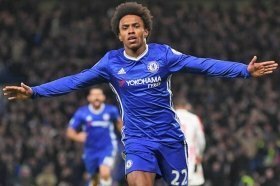 Chelsea could be bracing themselves for another transfer approach for Willian with Chinese Super League side Dalian Yifang having joined the race for his services. The 30-year-old has been on the radar of Barcelona over the past six months but the Blues have refused to part ways with the Brazilian regardless of the proposal on the table. Still, their resolve could be tested further in the current transfer window with Yifang said to be planning a significant transfer bid to lure the Brazil international. Blues boss Maurizio Sarri has already stressed that he has no plans of parting ways with Willian this month and he repeated the same stance following the Newcastle United game yesterday. Willian has contributed just three goals in the current Premier League season and one of those came during the Magpies clash where he scored with a stunning curling effort. The Brazilian currently has 18 months remaining on his existing deal with the Blues and so far, there has been no progress in terms of extending his contract.